On November 21-23 the Walker will present Disabled Theater, a collaboration between Paris-based choreographer Jérôme Bel and ten actors with disabilities from the Zurich-based company Theater HORA. Formed in 1993, Theater HORA took its name from a character in the company’s first production. The group has performed in numerous festivals around the world, including all over Europe and in South Korea, and has won multiple awards. Theater HORA members have acted for television and performed in a professional dance video, and one HORA actress, Julia Häusermann, was awarded the Alfred Kerr Acting Prize in Berlin last May. Jérôme Bel was introduced to Theater HORA in 2010, and initially was not interested in working with the company. Nevertheless, he watched some clips of their work and was deeply moved: “The emotion I felt was so strong that I couldn’t think. I realised that I wouldn’t be able to understand this emotion, which is unusual for me. My desire to work with them came from this first experience because I needed to understand what had happened to me the first time I saw them.” The premise of Disabled Theater is simple: it is a staged re-telling of Bel’s first interactions with the theater HORA actors. While Theater HORA is one-of-a-kind in Switzerland, there are numerous theater companies around the world that include people with disabilities. Last January, Back to Back Theatre, a company based in Australia, came to Minneapolis to perform as part of the Walker’s annual Out There series (for more information on their work, check out this conversation between Back to Back artistic director Bruce Gladwin and Walker Web Editor Paul Schmelzer). 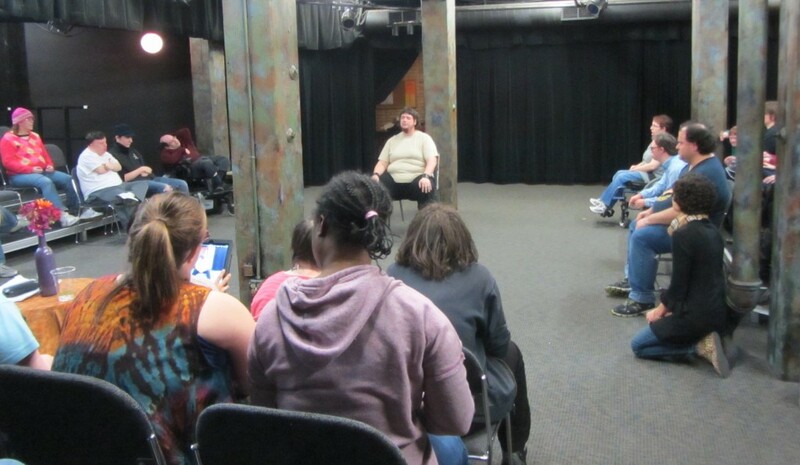 Minneapolis is also home to Interact, a center for visual and performing arts whose mission is “to create art that challenges perceptions of disability.” Founded in 1996, the organization provides theater and studio art opportunities for more than 125 artists with disabilities. 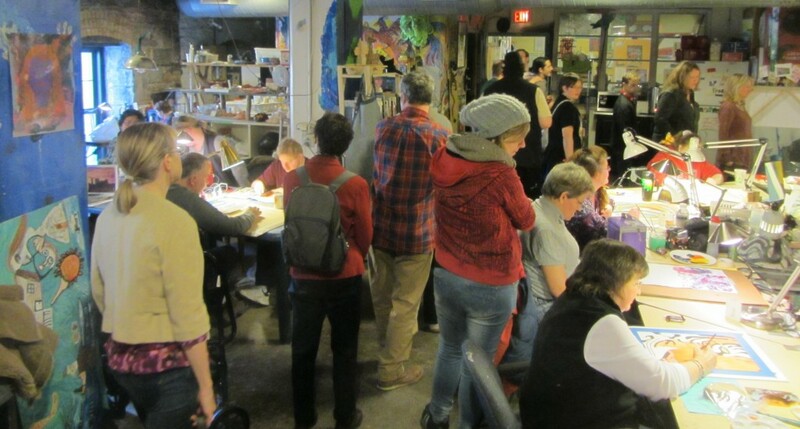 The day after their arrival in Minneapolis, Theater HORA paid a visit to Interact Center, where they took a tour of the studios, galleries, and rehearsal spaces, and met many of the visual and performing artists. Since Interact actors are busy with their current show and will not be able to see Disabled Theater, Gianni and Remo of Theater HORA gave brief, spirited performances of their dances that they will perform at the Walker this weekend. Interact founder and creative director Jeanne Calvit spoke about her organization and fielded questions from the HORA actors, and Interact actors asked questions about Theater HORA, communicating through translators. To wrap up the visit, everyone joined in an energetic dance party that opened up a new realm of communication to easily circumvent the language barrier. Calvit also had much relevant insight to share about creating art with people with disabilities. She told me about Interact’s collaborative process: the actors and staff create their plays through improvisation, allowing everyone in the company a chance to contribute. She explained the effectiveness of working with actors with disabilities through improvisation: “If we did theater in the more traditional way, giving everybody a script and saying ‘this is your role,’ it wouldn’t have the same passion because they’re not invested in it. 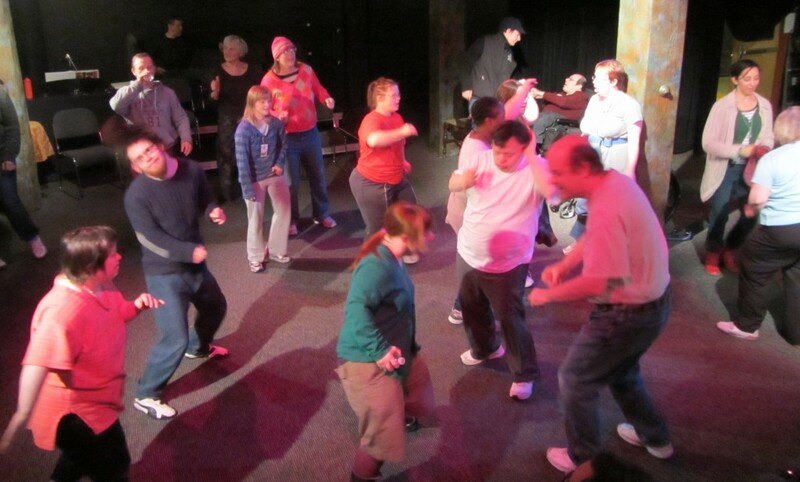 I think anybody who works through improv is going to have a lot more success with people with disabilities. A lot of them do better when they’re thinking on their feet and they can improvise than if you just give them a piece of paper and say ‘your role is this, you need to memorize that, and I’ll tell you where to move.’” Disabled Theater, in which the actors of Theater HORA play themselves, similarly represents the spirit of honesty and collaboration that underlies the creation of these works. Marcel Bugiel: Aren’t you afraid that some in the audience will think you’re staging a freak show, that you’re exploiting these actors and exposing their disabilities, that there’s an element of voyeurism in the show? Jérôme Bel: That doesn’t worry me. For me theatre is precisely about being able to see what you’re not used to seeing, what’s hidden and concealed from view… The question of performance by people with learning disabilities is complicated because these days it’s highly unthinkable. You don’t know how to react when you’re confronted with them, their presence is hugely embarrassing because they’re not represented in the public domain. And for as long as that is the case, there will continue to be embarrassment and uneasiness. The only method is confrontation… this community has to be given greater visibility. In its raw, honest fashion, Disabled Theater guarantees greater visibility of people with disabilities by placing them and their life stories on stage, necessitating that audience members confront their own preconceptions and assumptions about disability. Jérôme Bel and Theater HORA present Disabled Theater November 21-23, 2013 at 8 PM in the McGuire Theater. Stay after the performances for a postshow reception with the artists (Thursday, November 21), a Q&A with Jérôme Bel (Friday, November 22), and a SpeakEasy discussion with local artists and a Walker tour guide (Saturday, November 23).